Fernanda D’Agostino, Lamentations, 2013, video projection. Installation view. Portland-based artist Fernanda D’Agostino’s retrospective “The Method of Loci” is a feast of sensory experience and symbolic power. The exhibition’s title references the ancient art of encoding knowledge in imagined architectural space. D’Agostino embodies this dematerialized practice, transforming the interior of the gallery into a labyrinth of darkened chambers and corridors that house interrelated video and sculptures from the 1980s to the present. A brooding, introspective mood pervades in works that explore the presence and cultivation of memory in relation to the artist’s life and to related political histories. 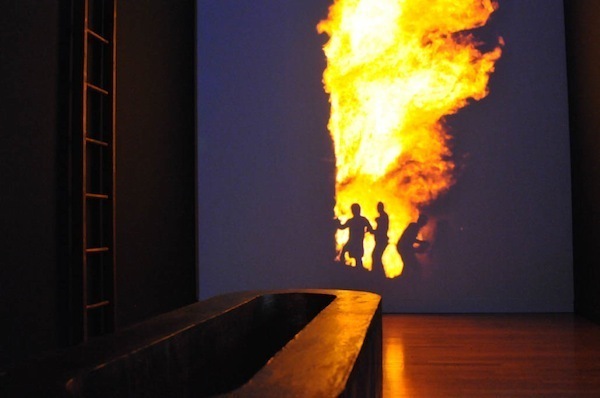 In the video installation Lamentations, 2013, footage of tall seething flames glows on one end of a narrow room, with silhouetted hands performing gestures of lamentation and mourning on the other. The hands’ sacerdotal movements were inspired by Giotto’s fourteenth-century frescos in the Scrovegni Chapel in Padua, and the leaping flames were shot in Italy during the Farchie Festival in the Abruzzo region. During the festival, enormous towers of dried reeds are ritualistically inflamed in remembrance of a past miracle that saved the community. In D’Agostino’s installation, the patterned movement of the flames and wringing hands swell into an overwhelming impression of trauma and destruction. The raw presence of suffering is laid bare without nostalgia. In the corridor adjacent to Lamentations sits an unassuming sculpture, Fate, 1994, which consists of a small white desk containing two stacks of wax tablets. Closer inspection reveals that the tablets are, in fact, typescript letters. The visitor is invited to hold and read the letters with narratives that include a first-person account of Nazi Germany in Karlsruhe written by the artist’s grandfather-in-law, whose family fled the country just after Kristallnacht in 1938. The tactile surface of the waxen letters subtly grips the reader’s hands—a perfect metaphor for the lingering psychological effects of D’Agostino’s haunting work.